When families look at financial aid packages they often assume that a school’s financial aid support will remain the same for four years. That, however, is a dangerous assumption to make. The financial support that some colleges and universities give students will shrink after their freshmen year even as their yearly costs continue to rise. I can’t speak for schools that do this, but you could certainly make the case that colleges are taking advantage of this reality: students don’t have a lot of leverage. A junior, for instance, who sees a drop in his aid package probably isn’t going to leave for another school. Families are going to find the extra money or borrow even more. When you’re researching schools, you want to check not only the average level of financial support for freshmen, but for other undergrads as well. I got that excellent advice from Ricki Bennett, a former administrator at the University of California and a vice president at COLLEGEdata. At this point you are probably wondering how you can determine if a university will become stingy (or stingier) after a student’s freshman year. You can use COLLEGEdata, one of my favorite college research sites, to find out. 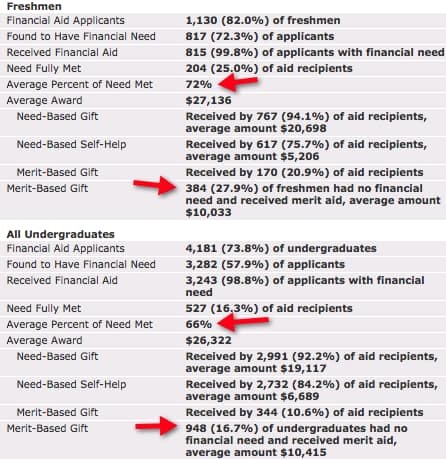 There is a lot to look at here, but what I want you to focus on is the percentage of financial need met for freshmen (72%) and the average percentage of need met for all undergraduates (66%). This drop is reflected in the average need-based gift of Loyola Marymount students. 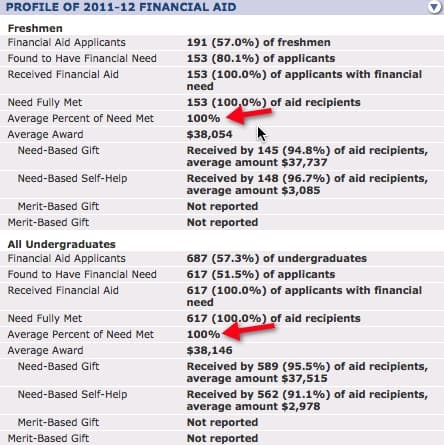 The average need-based gift aid for freshmen was $20,698 versus $19,117 for all undergrads. I should also mention that a school that only meets 72% of need is underwhelming, which helps explain, in part, why Loyola Marymount made the federal list. I recommend that students, who need significant financial aid, look for schools that meet a much higher percentage of need. 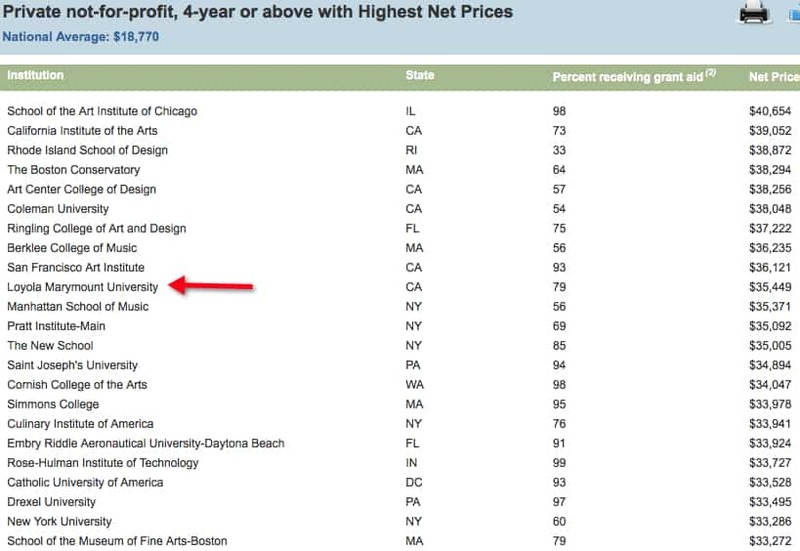 I also noticed that the percentage of affluent students at Loyola Marymount, who received merit scholarships, dropped significantly after their freshman year. While 27.9% of freshman received a merit scholarship, only 16.7% of undergrads had a merit scholarship. That’s a significant drop off of students qualifying for merit awards. Just to show you that not all schools treat older students differently when it comes to financial aid, I selected a school with excellent financial aid – Haverford College. Haverford meets 100% of need for its freshman and all other undergrads. That’s as good as it gets. Like a lot of elite schools that are ranked extremely high in U.S. News’ college rankings, Haverford doesn’t provide merit scholarships to rich students. It doesn’t have to because they will attend without the carrot. Lynn O’Shaughnessy is the author of the second edition of The College Solution. 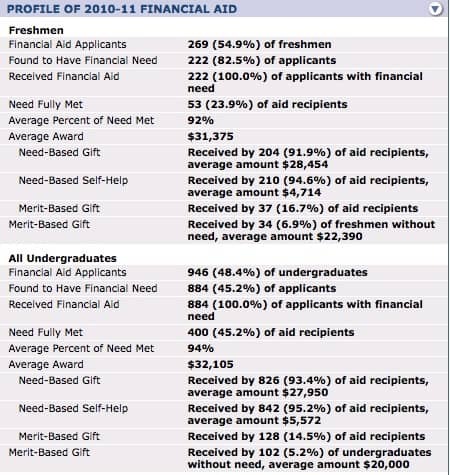 How much of this disparity do you think could be attributed to less merit scholarship aid and financial need aid being given to transfer students? I believe a number of LMU’s academic scholarships are only granted to incoming freshmen. Another thing that can cause aid to drop in subsequent years is that families’ financial circumstances can change. Although we don’t see enough incomes on the rise in this country right now, it does happen, and so too can unemployed parents later find work. When those types of things happen, eligibility for need-based aid (from the college, federal government or state government) can decrease. LIkewise, if during the freshman year a kid has an older sibling in college, but that sibling graduates and later on the family only has one kid in college instead of two, need based eligibility decreases. Other students might drop to part-time as upperclassmen, which limits eligibility for some aid programs. When you make the point that “students don’t have a lot of leverage” right at the beginning of your article, and use words such as “stingy,” (as if aid is limitless and determined arbitrarily), you give the impression that eligibility is based on negotiation and that a decrease in aid in subsequent years is the result of deliberate bait and switch tactics on the part of the school. After 28 years as an aid administrator, I think that is an unfair accusation, and you present no data that supports it. Did you speak to anyone at Loyola Marymount to ask them why this might happen? Thanks for your comments David. All those points about factors that contribute to a child getting less aid after the first year is true. I think it’s just as true that many students will need the same amount of aid or more — particularly in this economic climate. I used the word stingy because I think it’s a fair characterization of expensive schools that meet a low percentage of need. Of course it’s my opinion, but I think a school like Loyola Marymount fits that description. There is a reason why LMU landed on the U.S. Department of Education’s net price list of the most expensive private schools in the country. I’d call it a hall of shame list. I didn’t not contact LMU. This was not intended as a post about the Jesuit school’s financial aid policies and practices. 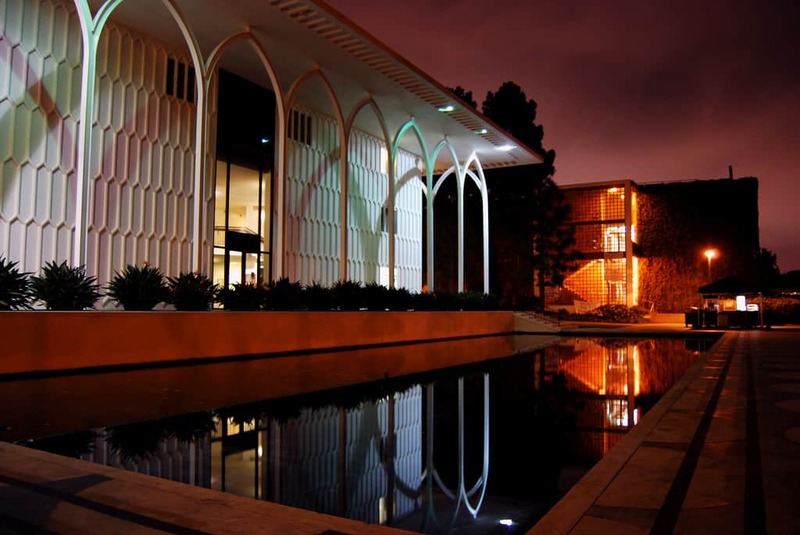 I used Loyola Marymount as an example to illustrate the type of statistics that families should be examining as they evaluate a school’s affordability. The issues that you raise are certainly factors that families can ask about. In your article you don’t seem to mention the fact that a significant number of students could be loosing their academic scholarships due to poor academic performance. We are a public four year institution and very few of our students loose their institutional scholarships that generally require 30 credit hours earned per year (fall, spring, summer) and a cumulative gpa of 3.0. However, one of the State Scholarships, the S.C. LIFE Scholarship is based on all collegiate hours and all collegiate cumulative gpa only 52% of freshmen retain it going into sophomore year. Another point, state need based grants are funded annually and subject to significant swings in funding level. Our institutional need based grant funding is funded annually and can be negatively impacted if we have a higher yield in students who were offered scholarships. The models predicting yield over the last three years have been less accurate than years past. Finally, with the discontinuance of the federal Academic Competitiveness Grant and National Smart Grant in 10-11 it puts more pressure on our limited institutional funding. Just some thoughts from a public school. Thanks Don for your observation from a public institution. If a scholarship is going to be hard to retain, whether at a private or state institution, I think it’s incumbent on the school to let prospects know that. Clearly at LMU, the merit requirements must be stiff otherwise why would so many students appear to be losing their merit scholarships. I was absolutely shocked to see how many students in my state lose the state merit award (which is based on a combination of high school grades and GPA). It requires maintaining a 2.5 GPA in college. By the end of freshman year 40% of students have lost the award! I agree students are well advised to look at how well colleges meet financial need beyond freshman year, but equally important is really understanding what is required to maintain their scholarships. Our state university makes it very clear to students through orientation sessions and paperwork, yet many students still do not maintain the minimum GPA. No matter what is said some students are immature and have probably never faced real consequences before. Some students would be well advised to take a bit lighter load freshman year and look really carefully at how many hours they work. Sacrificing a full scholarship for a minimum wage job is penny wise, pound foolish. Thanks for your comments. That is shocking that so many students lose their scholarships when the GPA requirement is so low. I think that suggests that there is a lot of grade inflation going on in high school! Of course, we already knew that. Which website provides the data you have shown in the table above?